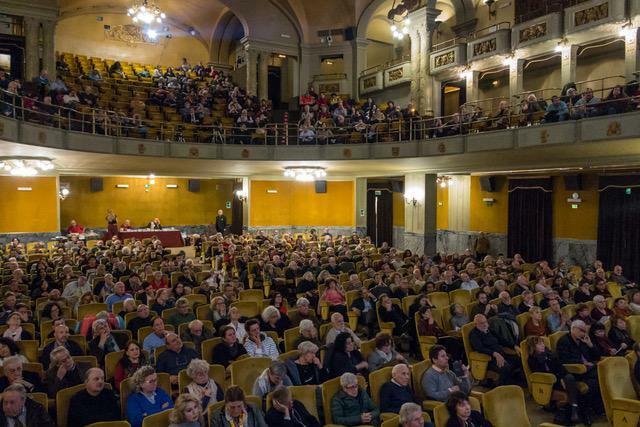 “EXIT NATO!” – was the glaring title on a huge screen greeting the several hundred participants of the Anti-NATO Conference in Florence, Italy, on 7 April 2019. 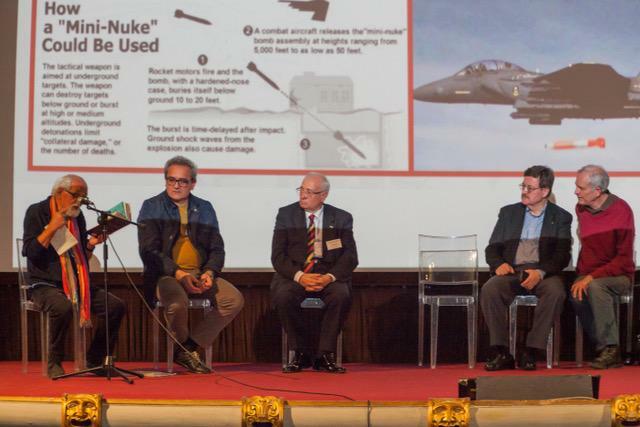 Officially it was called The International Conference on the 70th Anniversary of NATO, sponsored by the Italian No War No NATO Committee, Global Research of Canada and the International Coalition to Ban Uranium Weapons (ICBUW). I had the privilege to attend this important forum. Following the EXIT NATO poster, was another huge slide decorating the conference wall – proclaiming that NATO, as a reward for all their work for Peace, should be rewarded with the Peace Nobel Prize. No doubt, nuclear armament and eventually nuclear wars – to be fought by NATO – by whom else – will make the world a safer place. Wars are actually good for Peace. They are also good for economics, but they are particularly good for Peace. I’m not kidding you – these are declarations one can read – and has been able to read since practically 9/11, in such prominent “Truth News” papers like the Washington Post and the NYT. – So, why not the Peace Prize to NATO? – It wouldn’t make much difference, considering the track record of the Nobel Prize Committee – it would fall right into place. Other than that, the conference basically outlined the atrocities committed by NATO, its associate and crony terrorist armies, ISIS, Al Qaeda, Al Nusra – and so on, changing names for revolving terrorists, recruited and trained by the CIA and funded by Saudi Arabia and other Gulf countries, and of course the US directly or through her many State Department funded and subsidiary NGOs, like the National Endowment for Democracy (NED) and many others. And of course, not to forget a prominent funder of terrorism, Turkey – who is now trying to make a smiling face to Russia and the east, even flirting with the idea of entering the club of the Shanghai Cooperation Organization (SCO); on the one hand purchasing Russian military defense systems – the S-400 – and at the same time US fighter planes F35, dancing on as many weddings simultaneously as they can. – Who would trust Turkey under Erdogan? – Turkey also still hosts one of the most strategic and most dangerous nuclear-equipped NATO bases – literally between east and west. 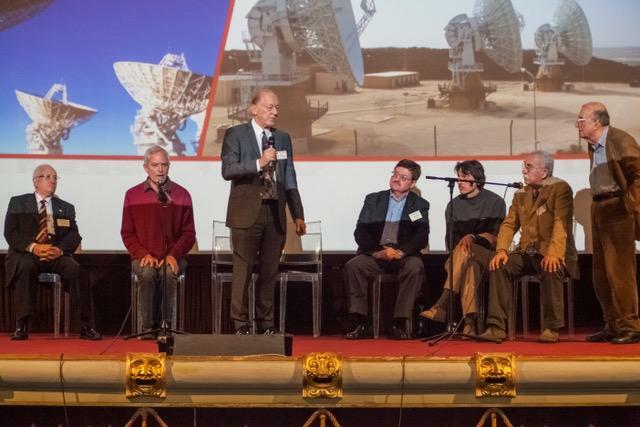 The Conference recalled the Cold War. By now everybody knows – really? – well, for those who don’t – that the so-called Cold War was one of the best propagated and fakest news of the 20th Century. It’s a brilliant idea that sprung out of the McCarthy Nazi-era – like NATO itself – to arm the US to the teeth – maximizing profits of the military industrial complex, under the pretext of halting the advancement of the Soviet Union into just liberated western Europe, just liberated from Hitler’s Nazi-Germany. Never mind that western Europe has been saved by the Soviet Union who lost 25-30 million people and basically their transport and production infrastructure. Yes, it was not the so-called allies – US, UK and France – they came in last, when the bulk of the job was already done by what is today Russia. But of course, no western history book would tell you the truth. In fact, it must be said here too – the US funded Hitler’s war against the Soviet Union with money channeled from the FED, through Wall Street banks, and eventually through the Rothschild dominated Bank for International Settlement (BIS), located in Basel, Switzerland, right at the border to Germany, from where it was easy to pass the money on to the Reichsbank – Hitler’s Central Bank. Yes- that’s how the US was already then dancing on various fiestas at the same time; on the one hand bombing Germany and, on the other, financing Germany’s war against what the US already then perceived as an archenemy – The Red Scare – the Soviet Union. Well, these acts of treason then were the precursors of NATO today. Anything socialist is evil for the US, still today. Trump himself and his minion clowns, Pompeo, Bolton and Pence – are lambasting Venezuela and Cuba for being evil and destructive socialist countries – and that socialism will not be tolerated nowhere by the falling empire – sorry, falling it is – of the United States of America. The other purpose of the Cold War farce, was to make the Europeans believe that they were under a constant threat of a Soviet invasion, that they had to arm themselves also to the teeth – imagine war-recovering Europe having to spend their money on arms for no use! – and of course most of these weapons had to be bought – yes, you guessed it – from the US military industrial complex – more profit for the war oligarchs. The Anglo-media even created a virtual barrier between western “free” Europe and the bad-bad Red Scare, the Soviet Union, the Iron Curtain. Yes, the Iron Curtain; children in school were indoctrinated to be aware that the enemy is luring behind the Iron Curtain, and that the enemy always comes from the East. Hilarious, when you think back. At that time (almost) everybody believed it. And the third, or perhaps first objective of the Cold War, was to block the Soviet Union from developing a viable and autonomous economy with which they could thrive, as most socialist countries do, until they are boycotted, punished and financially “sanctioned” into suffocation – by the west. These illegal financial manipulations with and within sovereign countries’ economies, are, of course, illegal by any standards of international laws – laws that have become meaningless in the light of US / NATO power, scary nuclear power. These acts of financial and human rights high crimes are only possible, because of the all dominating, fraudulent US-imposed – and NATO-protected – western monetary system. The NATO-driven Cold War, a constant nuclear threat towards the Soviet Union, was intended to force Russia also to arm for their defense, instead of being able to use their economy’s added value to rebuild their devastated country. The USSR was never a threat to Europe. There was never an intention of the Soviet Union to invade western Europe. The same today, we are being made believe that Russia wants to invade Europe – that’s why NATO needs to build all these military bases, at the door step to Russia. Russia is by far the largest country, territory-wise, in the world, they don’t need to add more land. Historically, neither Russia or China have a record of expansionism. 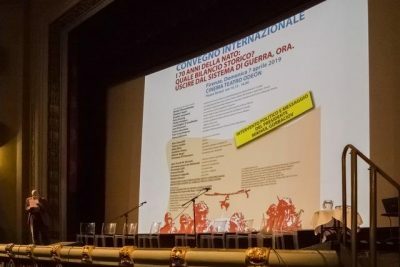 The Florence Anti-NATO Conference also recalled some of the most abject killing sprees of NATO in its 70 years of existence, the wars in Afghanistan, Iraq, Libya, Syria, Sudan, Yemen, Ukraine – the Maidan massacre followed by the so-called Ukrainian civil war – and the crowning of sorts, the ten-year war on Yugoslavia – the total destruction of Yugoslavia, with the final blow 1999, the merciless bombing of Bosnia-Herzegovina and Kosovo. – Why Yugoslavia? – Let’s dwell just a moment on this war of cruel destruction and killing – because it is so typical for Pentagon-driven wars of annihilation. Yugoslavia, a socialist country, in the 1970s and 80s under Maoist President Tito, had a prosperous economy, much more so than the rest of Europe. The US-dominated west cannot let a socialist economy flourish. Other countries, especially stagnating western Europe, could get ideas. This expansion east – ever closer to Moscow, is a flagrant breach of a promise made by the allied forces. In 1991, then German Foreign Minister Genscher promised Russian President Gorbachev that NATO would not move one inch further east than Germany. In fact, he assured Gorbachev that NATO would not move into what before the German unification was Eastern Germany. This promise was unfortunately never recorded in writing, and Gorbachev was miserably betrayed. As we know by now, a betrayal by the west is very normal. In the meantime,12 more NATO bases east of Germany, including in former East-Germany, were built. Wars have a cost – a financial, economic and a social cost. The US official military budget for Fiscal Year (FY) 2018 is US$ 700 billion; for FY 2019 Trump proposes US$ 750. If approved it would be a 40% increase in the last 9 years. But that’s not all. This is just the officially published figure. The real cost for the war, defense and security apparatus to which also the opaque CIA and associated secret services count – is well over a trillion dollars, perhaps as much as US$1.5 trillion – per year. The US has currently about one million military personnel stationed in 175 countries around the globe. The Pentagon maintains about a thousand military bases in more than 100 countries. The war cost, in currently seven war theatres is prohibitive – medical costs for veterans, for social services to returning veterans – and we are not talking the cost of off-battle ground lives, i.e. by ever-mounting suicide rates. The Veteran Administration released a study that covered suicides from 1999 to 2010, showing that roughly 22 veterans were dying by suicide per day, or one every 65 minutes. The reality is most likely a much higher figure – and the despair and human depression from anxieties related to the never-ending wars has increased exponentially in the last 9 years – more suicides, more desperation, more broken families – – entire generations of kids with fathers at war. This cost cannot be put in figures of dollars and cents – it’s a social cost that bears its toll in years, perhaps generations from now. The US spends per capita ten times more than the rest of the world together on military / war expenses. President Trump requests European NATO countries to increase their military budget by contributing more to NATO, first up to 2% of GDP – threatening he may decide to withdraw NATO from Europe, if Europe does not comply with his request, still making believe that NATO is a defensive force – protecting Europe- from what, and from whom? – Good-bye NATO. This is the moment to call Trump’s bluff. But NATO – the Trans-Atlantic Treaty Organization – has also gone overseas to Latin America. NATO has a Cooperation Agreement with Colombia, where the US has 5 military bases – which will automatically convert into NATO bases. NATO is also negotiating with Brazil’s new Nazi-leader, Bolsonaro, to enter Brazil, and, as such being a threat and a potential attack force to topple the Venezuelan democratically elected socialist government. Washington makes no secret – they want Venezuela’s hydrocarbon resources, the world’s largest reserves, gold and other minerals of which Venezuela is rich. NATO is perfect to do the dirty job. But it gets worse, this Trump clown or the masters behind him had recently the audacity to ask for a European military budget increase to 4% of GDP – or else…. Yes. Let’s decide for else. Good riddance, NATO. Imagine, what could be done, with more than a trillion dollars or euros per year – in terms of building up education, health services, public infrastructure, and other social services – and expand these services to developing countries, to those very countries that are now bombarded mercilessly by NATO! – This, dear People of Europe, is your tax money. Do you want it to be spent killing people around the world for Washington’s world hegemony? – NATO does not protect you. NATO has been designed as an aggressive force – you were just never told. But look out of the window, the window of your ‘safe space’, and you will see the squandering of your tax money. NATO is invading the space of Russia and China, countries that are seeking friendly relations with the rest of the world, they are seeking a multi-polar world, but encounter instead a response of aggression. NATO is preventing the natural, namely friendly relation and trading as equals within the huge Continent Eurasia, of which Europe has been artificially separated as a continent. This tremendous landmass Eurasia, includes also the entire Middle East and connects to Africa. This enormous mass of land and people and resources – does not need the west, the west, called America. Wouldn’t it be wise for countries and people of Eurasia, to just live sovereign lives, with friendly interactions, trading as equals not with a one-upmanship as is currently the norm for trading between the rich OECD nations dominating the World Trade Organization (WTO), with the rest of the world- which depends on trade but is always on the losing end? One more point – that needs to be understood. Europe, the European Union as it was conceived and is limping along today – has never been the idea of Europeans, but was born during WWII in the heads of the CIA, then transplanted into some “willing” European heads and then ‘defended’ by NATO – the “unifying force”. Europe has no Constitution, only a number of non-binding accords, like Maastricht and Lisbon – but no Constitution that holds it together, that outlines a common vision in defense, in economic development, in monetary policy. The European Union results in a bunch of country, some even hostile to each other. They have a common currency, the Euro, without even having a common economic development objective. This currency, forged as the little brother of the US-dollar, equally nothing but fiat money, no backing whatsoever; this currency is not sustainable. So, the currency barely 20 years old, will eventually collapse or fade, and so will the European Union. It hasn’t happened yet, because NATO is holding it together, because Brussels is nothing but a puppet of the Pentagon. It is Washington through the Pentagon, and through NATO that is running Europe. People of Europe – is it that what you want? Your tax money spent killing people and destroying countries around the globe, and having lost all independence, autonomy as a country, as well as monetary sovereignty – by being run by a military killing machine, called NATO? Peter Koenig is an economist and geopolitical analyst. He is also a water resources and environmental specialist. He worked for over 30 years with the World Bank and the World Health Organizationaround the world in the fields of environment and water. He lectures at universities in the US, Europe and South America. He writes regularly for Global Research; ICH; RT; Sputnik; PressTV; The 21stCentury; TeleSUR; The Saker Blog, the New Eastern Outlook (NEO); and other internet sites. He is the author of Implosion – An Economic Thriller about War, Environmental Destruction and Corporate Greed – fiction based on facts and on 30 years of World Bank experience around the globe. He is also a co-author of The World Order and Revolution! – Essays from the Resistance. He is a Research Associate of the Centre for Research on Globalization.